Alright everyone, it’s time to ditch the box pancake mix and butter to make healthy swaps! Making breakfast from scratch is one of my favorite things that I look forward to each morning. I make it a habit to wake up at least 30 minutes early in order to create a healthy meal that will fuel me until lunch. Protein pancakes are my go-to breakfast item and it’s great that you can make these fit your own macros of protein, carbohydrates, and healthy fats. Mix all ingredients in Magic Bullet or blender until a smooth consistency is reached. You may need to add in more almond milk if batter is too thick. 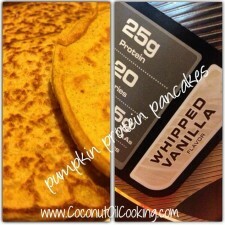 Spray pan with Kelapo Coconut Oil non-stick coconut oil cooking spray and make pancakes on medium-high heat. Plate pancakes and drizzle with sugar-free or regular maple syrup. Serve and enjoy! These pancakes come out so light and fluffy from the mixture of coconut oil and pumpkin. I could seriously live off of these each morning! Remember, you can always up the ingredients to make a larger batch, especially if you’re making them for your significant other. I usually double the recipe if I’m making them for my boyfriend. For other breakfast ideas, be sure to check out my Oreo Protein Pancakes, Blueberry Coconut Bars, and this delicious PB&J Smoothie.